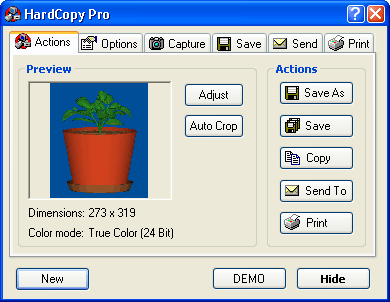 HardCopy Pro is the professional, easy to use screen capture tool for Windows! HardCopy Pro can capture rectangular screen areas and whole windows. The captured images can be cropped very easily and the color depth can be changed to any desired value from monochrome to true color. Images can be saved in all major file formats, copied to the clipboard, edited with any image editing program, printed, emailed, etc. Timer for automatic captures. The main dialog of HardCopy Pro does not disappear when I click "New" How can this be fixed? Qweas is providing links to HardCopy Pro 3.3.6 as a courtesy, and makes no representations regarding HardCopy Pro or any other applications or any information related thereto. Any questions, complaints or claims regarding this application HardCopy Pro 3.3.6 must be directed to the appropriate software vendor. You may click the publisher link of HardCopy Pro on the top of this page to get more details about the vendor.